Yangon Heritage Trust has advised changes to the exterior of a new building in Rangoon as the structure detracts from surrounding colonial-era architecture. RANGOON — A heritage conservation group has proposed an alteration to the exterior design of a newly completed building in downtown Rangoon, as the structure detracts from the surrounding colonial-era architecture. Located at the corner of Merchant Street and Pansodan Road, the more than six-storey building was redeveloped by Shwe Than Lwin company, a business conglomerate founded by Kyaw Win which owns Sky Net broadcasting service, among multiple other business interests. 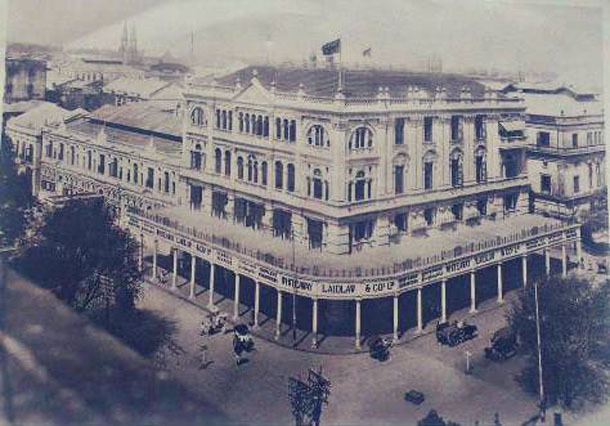 The site was formerly occupied by Whiteaway and Laidlaw Co, the biggest department store in Rangoon, famous for its large portico supported by more than 20 columns and dating back to the late 19th century. After Burmese independence in 1948, the store was nationalized to be used as a government office and host to the “State Agriculture Marketing Board” until it was damaged in a blaze in the early 2000s and subsequently demolished. The site was then opened to private investors for development. Thant Myint-U, the founder of Yangon Heritage Trust (YHT), told The Irrawaddy that the group had reached out to Kyaw Win in October to propose some alterations to the structure that would be more sympathetic to the surrounding area, where several century-old buildings remain. “YHT have been very concerned with the building as it is right in the middle of the downtown conservation area,” Thant Myint-U said. The historian explained that the intersection of Merchant Street and Pansodan is probably the most important single heritage area in downtown Rangoon. “Other than this one building, it’s one of the last completely intact early 20th century streetscapes left in all of Asia,” he said. The proposed alterations were, “not a perfect solution, but I think a reasonable compromise,” Thant Myint-U said, adding that he hoped to meet the developers this week. Kyaw Win was not available for comment on Tuesday. 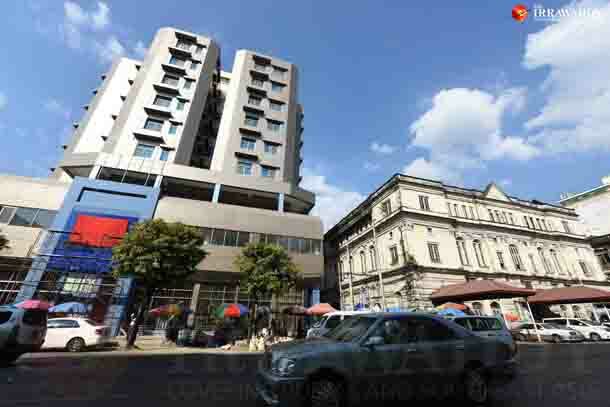 In 2013, the YHT also slammed the planned construction of a US$100 million high-rise office tower directly next to a century-old heritage building in the heart of the commercial capital. After the objection, the government opted not to allow the project on the grounds that nothing should be built that might harm the surrounding heritage environment. “We are not against modern buildings. But they have to be sympathetic to the surrounding area,” said Moe Moe Lwin, the director and vice-chairman of YHT. She said for the building that has now been completed, the only viable option was to undertake some exterior alterations. “The current design is not quite suitable for the surrounds. If the owner agrees to make changes in design, it would be their contribution to the preservation of the downtown heritage center,” she said.